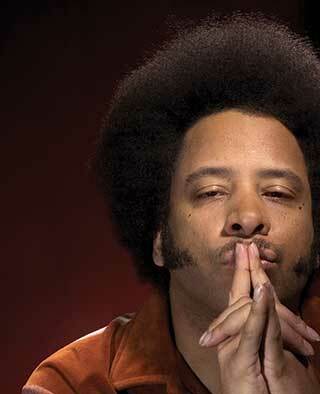 HKR 07-17-2013: Yesterday we caught up with long time activist and artist Boots Riley of the Coup and had a great dialogue on Hard Knock Radio about the George Zimmerman verdict and the subsequent demonstrations that have kicked off all over the country in the aftermath. Boots laid out his thoughts on this and connected it to larger pictures that are in play all over the planet.. We talked at length about the protests and the tone they have taken and how they compare to protest in other parts of the world. We also talked about what should be some possible end goals especially if one perceives the justice system to be beyond repair. Boots of course noted the importance of not seeing the issues around seeking justice for Trayvon Martin in isolation, but instead as something that is systemic requiring us to have deeper analysis and long-term goals for fundamental change. We also talked about Boot’s new album ‘Sorry to Bother You’ and his upcoming shows in the Bay Area this weekend..
great conversation. really appreciated it.